Our small “Yoga Hideaway” offers yoga classes for up to ten yogis. This gives you a very private atmosphere and a good attention of the teacher. Based on the experience from the last four years since opening Niyagama House, with many happy yoga guests from all over the world, we are offering since August 2017 three wonderful yoga options: You can either book single classes or one of our yoga retreat packages. With booking single classes, ideal for a short stay of one or two days, you stay completely flexible. With booking one of our two yoga retreat packages you commit to do something good for your body & mind, harvesting our discount offers & goodies that come along the package deal. And we want to be fair: you still can book your yoga package here after your first class to give you a chance to check out the teacher ;-). With these options we hope to make it as easy and as flexible for you to to create your perfect retreat time in Niyagama House! Book single classes to create your perfect day. For a short stay of one or two nights, or also for a longer stay, in case you want to stay a 100% flexible. > The morning Hatha Vinyasa Flow classes from 7 to 8.30am (Sat to Thu) do offer sun salutations and yoga poses to strengthen and stretch your body. 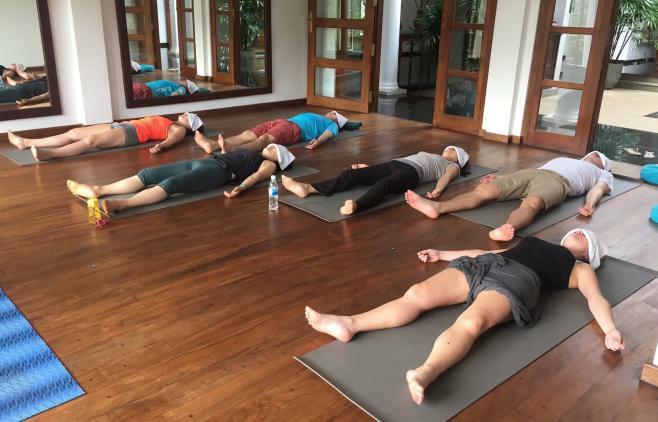 The class is followed by a guided meditation and a full body relaxation in shavasana from 8.30 to 9am. Group Class Price: 2.900 LKR = 19 USD, also if just one guest is registering. The 30min guided meditation & relaxation is complimentary. > The afternoon classes from 4 to 6pm (Fri to Wed) are offering you a yoga kaleidoscope to choose from: relaxing Yin Yoga, exciting Aerial Yoga, calming Mindful Self-Compassion Meditation, energizing Energy Medicine Yoga, and blissful Aerial Deep. The choice is all yours – every afternoon something else. Group Class Price for 120min: 25 USD per person, minimum of three yogis registered. In case there are only one or two registrations for the afternoon class, we can also do a different class and go for a 60, 90 or 120min private class. Private Class for 60min: 44 USD per class, for one or two person. Private Class for 90min: 56 USD per class, for one or two person. Private class for 120min: 75 USD per class, for one or two person. All classes need to be booked and registered for until 8pm the evening before. You will receive a Yoga Voucher Card for three Hatha Vinyasa Morning classes, including the Meditation afterwards and you can do three classes in a row or skip a day and do it on another day. To keep your days totally flexible, the afternoon classes are not included in the package, but we offer a discount for them - only to our “Package Yogis” :-). > A “good morning tea” or some fruits before the class. 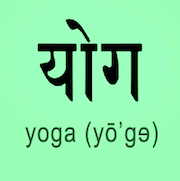 > 3 Hatha Vinyasa Morning Classes with guided meditation, 2 hours long. > A 10% discount on three afternoon classes (private or group class). > A 10% discount on three Spa Treatments. > A free bike rental on one day of your stay. > Three fresh and healthy king coconuts. > Complimentary hot water, herbal tea and ginger water during your whole stay. >>> AND, if booked in advance: the best rooms prices with a YOGA BLISS DISCOUNT on the room and suites prices – for all direct bookings on our page :-). You will receive a Yoga Voucher Card for five Hatha Vinyasa Morning classes, including the Meditation afterwards and you can do three classes in a row or skip a day and do it on another day. To keep your days totally flexible, the afternoon classes are not included in the package, but we offer a discount for them - exclusively for our “Package Yogis” :-)). > 5 Hatha Vinyasa Morning Classes with guided meditation, 2 hours long. > A 15% discount on five afternoon classes (private or group class). > A 15% discount on five Spa Treatments. > A complimentary guided tea plantation tour (60min). > One free laundry service. > Five fresh and healthy king coconuts. >>> AND, if booked in advance: the best rooms prices with a YOGA IMMSERSION DISCOUNT on the room and suites prices – for all direct bookings on our page :-)). 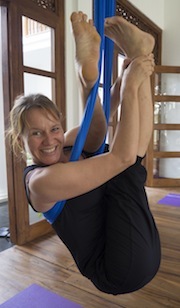 Elke de Silva, the co-owner, co-creator & co-founder of Niyagama House, is a trained Hot Yoga Teacher (Absolute Yoga, 200 hrs RYT in 2009) and Dana®Aerial Yoga Teacher (TT in 2015 in Niyagama House (http://dana-aerialyoga.de). She loves and teaches Vinyasa Flow, a style that is for her like a ‘meditative dance’. On her quest of studying new methods of Self-Healing, she did the Mindful-Self-Compassion (MSC) Meditation teacher training in June 2015 in Amsterdam and is practicing it since then. After teaching Street Jazz, Lyrical Jazz and Hip Hop for 15 years as well as being a dance performer and choreographer in Germany & Europe, she is grateful to teach in her own retreat, sharing her passion for Yoga and Meditation. Elke is every time again amazed about the transformational power of every yoga class and each meditation session, about how it can improve your health and have positive impacts on your mind. Her yoga classes are challenging, but always full of laughter and joy. Following an “inner calling” she is studying Energy Medicine Yoga and Conscious Dance, that she is integrating with an informative as well as playful approach into her classes. You like to do a retreat, but your partner prefers just chilling at the pool? 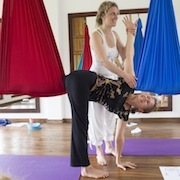 As we are not a "YOGA ONLY RETREAT", you can bring your “No-Yoga-Buddy" to share the room with you ;-). We will find something good to do for him, while you are enjoying your yoga bliss :-). Check here, which classes we do offer during the weeks, when there will be special retreat offers and also when there will be no classes in Niyagama House. Kindly do contact us via mail and we let you know the best discount option for your retreat stay here in Niyagama House. We will send you a voucher and you can easily book right here on our website booking system. The below mentioned quote from the best yoga teachers of the past is true: just do it :-). Therefore we want to offer you the space for being your own teacher. Our amazing roof terrace is always open, day and night. So just grab a mat and a cushion and do you own sunrise meditation at 6am or some moon salutations before dinner. Or of course feel free to use the yoga room, when there are no classes. Enjoy :-)! You want to come with your friends and with a special idea for your private retreat? Just contact us and we will make it happen ;-). You live nearby or stay in another hotel in the area? Come and be our day guest! Enjoy the morning meditation and the yoga class, jump into our fantastic pool and than head back to your hotel for breakfast. Or try one of our afternoon offers: Yin Yoga, Aerial Yoga, Conscious Dance or Mindful Self-Compassion. Of course you are also very welcome to relax here the whole day, surrounded by peaceful nature, maybe with a massage and a tasty lunch or dinner in our restaurant. In case you are on a low travel budget, we also can offer you to just book one of our retreat packages and stay in a small guesthouse in Galle, which is just 20min in a tuktuk away from us. Just send us a mail and we can make it possible :-))). You are a yoga or meditation teacher? A life coach or therapist? Invite your students, clients, customers to a special holiday in a special place, where you can offer your private classes or group sessions in a wonderful relaxing and healing surrounding. Niyagama House was designed by following the rules of the Sri Lankan Fengshui. And already many of our guests were completely amazed about how quickly and profoundly their relaxation and healing took place. Just send us a mail and we are happy to design your retreat here as individually as you like it. Read here about the last successful retreat, offered by Dhugal Meachem here in Niyagama House from Aug 24 to 30, 2017. Which meditation style can I learn here? Is Conscious Dance good for me? Read here about the kind of yoga, meditation and conscious dance styles that we offer.